LOCKE is one of those one location, one actor movies that seems to have found some footing with the advent of the cell phone making such movies more than just a film where some guy only talks to himself. In this case, the location is a BMW and the actor is Tom Hardy. This type of movie usually requires a good script and a strong performance, so I am always willing to give one a run. I watched LOCKE (2013) on 1.21.15. It was my first viewing of the film. LOCKE is something of an inconsistent movie. At its best, this is an absolute acting showcase for Tom Hardy in the titular role. It moves smoothly through time and provides a fair amount to think about in terms of what a man will do to find inner peace. At its worst, this is a movie which plays more like a BMW commercial with a repetitive rhythm as it bounds from bit to bit. If these two polar opposite forces were pulled far to one end, it would be a great movie. Pulled too far to the other end, it would be a dull film. Instead, we get a movie which is interesting, which features Tom Hardy’s undeniable charisma, but which also becomes predictable in its cadences. Ivan Locke works in cement. He has a huge job, the biggest ever in Europe, starting the next day. He hops in his car and starts driving. We learn, through a series of phone calls, that he won’t be making the job because he fathered a baby out of wedlock, and the mother is giving birth that night. He has a 90 minute drive to get through. This movie shows us that drive. He has phone calls with his wife and sons, his employer, his underprepared replacement at work, the mother of the baby, and a couple of others at various points. He cycles through these calls in a way which works out just right for a 90 minute movie to tell us a story. Most interestingly, in some of the between call moments, he has a conversation with his father – who is dead and not depicted physically – which makes Locke seem just a little bit crazy. Writer/Director Steven Knight has some definite ideas to put into this film. Locke is a man who’s own father was absent, so Locke is making a conscious choice to ruin his own life in order to not force that existence on his soon-to-be child. 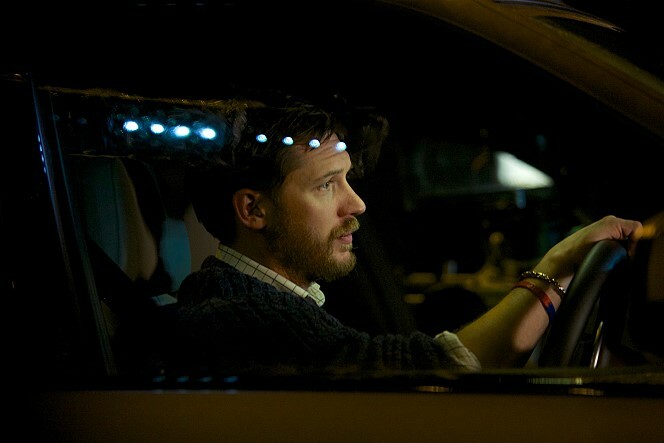 Locke is a man who is flawed, but who no one would describe as bad. He made a mistake, just once he insists, and luck would have it that his one mistake will be his downfall. It would seem he could avoid the downfall, but he wouldn’t be able to live with himself if he didn’t own up to his responsibilities. Because he is our protagonist, this puts his wife in the position of seeming somewhat unreasonable. This isn’t fair, of course, because she is never depicted and we only hear her voice. We don’t blame her for doing what she does, but we do feel like it is not reasonable. The movie, then, forces our perspective to be that of Locke’s. This is not a movie made to make us angry at its hero, but to make us feel for him, to make us feel like his life is not fair. We see his work ethic, we see his determination, we see his loyalty. Those characters who do not are marginalized because, even as we know he is making their own lives and their own choices immensely difficult, we never are forced to see it. This is a movie worth seeing for Hardy’s performance. It is subtle, powerful, and heart-wrenching. While there is some depth to be found, this isn’t some kind of revelation in terms of script or story. It’s a perfectly reasonable movie to get you through 90 minutes, but it isn’t on the same level in terms of tension as something like BURIED. ~ by johnlink00 on January 22, 2015. I agree that it doesn’t live up to the Buried standard of closed-quarters cinema. And I agree that Hardy makes this movie. A less-equipped actor would have left this movie severely lacking. Nice review! Thanks for reading! Glad you liked it too!